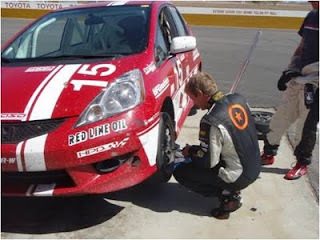 Rosamond, CA (April 12, 2011) – HPD continued its development of the Honda Fit B-SPEC package with a test at Willow Springs International Raceway. I, HPD engineer and B-SPEC Project Leader Lee Niffenegger, was joined by SCCA T-3 competitor Sage Marie and 2010 Grand Am ST champion Lawson Aschenbach. The goals of the test were to shakedown a newly completed Fit and to collect some data on the original prototype that was run at the NASA 25 Hours of Thunderhill. Some may remember the #93 B-SPEC Fit from the Performance Racing Industry show where the concept of B-SPEC was introduced in a joint announcement with Mazda. The B-SPEC cars were recently allowed into SCCA Showroom Stock C (SSC) as a kind of sub-class. The cars are slow enough that they shouldn’t upset the current competitors in the class even though they are allowed significantly more prep. The #93 was slated to head to the Honda Indy Fan Zone at the Long Beach Grand Prix the next day so its running was limited to some exploratory laps and a couple five and ten lap runs. 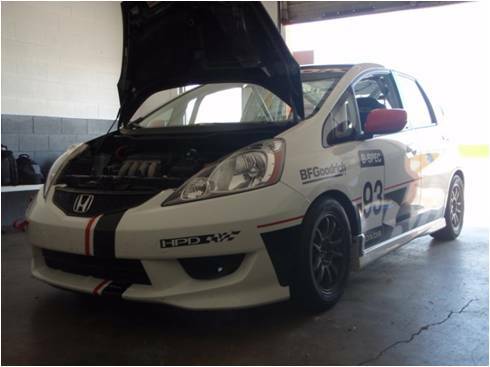 However, the #15 Fit was ready to roll and was still fresh from an SCCA Super School and Regional race at Buttonwillow Raceway Park. Team Honda Research-West (THR-W) rookie driver Derek Ferretti had received his SCCA Novice Permit there a couple of weeks earlier. This was the perfect use for the Fit as B-SPEC is envisioned as a place for aspiring “Touring Car” drivers to start their careers. However, the cars are so much fun that they might not want to move on! Lawson took the #15 out for his first laps around Willow Springs in the Fit. Lawson has been able to drive some pretty heavy machinery over his career. However, his first comment when he came back in to the pits was “This thing is a lot of fun!” This echoed ALMS champion Simon Pagenaud’s comments after driving at Thunderhill. Time to hide the keys from the pro drivers! After Lawson had the track down, it was time to get to business. We adjusted pressures to get the best use of the tires and then put on a set of new BFGoodrich R1’s. Having fresh rubber and a couple of top level drivers would allow us to see where the B-SPEC car stood relative to the existing SSC cars. Sage was able to put down a 1:42.2 lap. Not to be outdone, Lawson promptly topped that with a 1:41.8. This compares favourably with a 1:40.7 lap during the last SCCA National at Willow Springs. 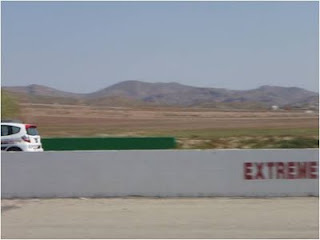 The current track record at Willow Springs is a 1:38.7. However, there is not much chance of a B-SPEC getting into that territory. All of this tells us that we have hit the right spot in performance for the B-SPEC car. The #15 Fit “pounded” around the track at Willow Springs for 3 hours or so during the test. Add this test to the 3 day Super School and the 25 Hours and that is a lot of track time. The Fit has only seen 3 sets of brake pads and oil changes in that time. We also only managed to burn a little over a tank of gas during the test. All indications are that B-SPEC will achieve its goals of a low-cost, fun to drive car. The bad news is that you never know what pro driver is going to show up in one!